There is one ski pass covering the two areas of Campo Felice and Ovindoli called the Ski Pass dei Parchi. The wide Campo Felice base is gently sloping and is ideal for beginner skiers. Ski school meets here and a number of green and blue runs are accessible from the base area lifts. Several intermediate runs (designated blue and red) fan across both sides of the mountain. The longest descent – Degli Innamorati – is a thigh burning 2.5 km. 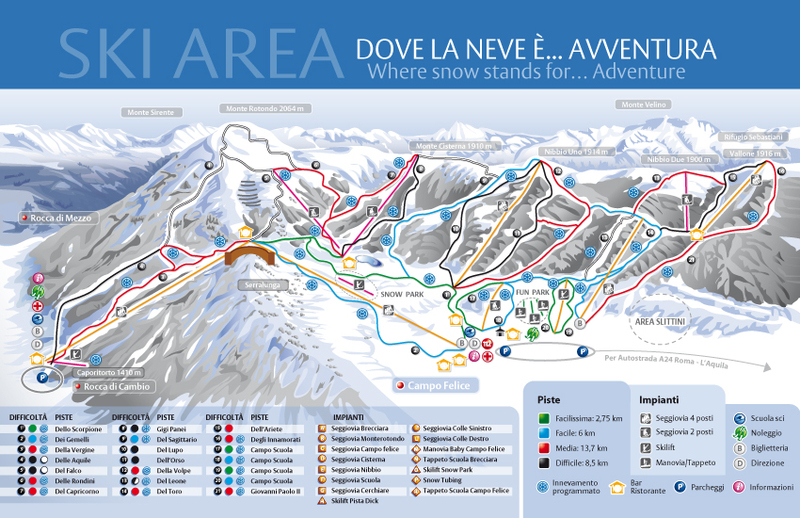 Although the number of runs for advanced skiers is limited, the Della Vergine and Delle Aquile runs are both steepish and off piste. There are a total of six runs designated advanced (black runs). Its hard to imagine that there can be so much snowfall and skiing so close to Rome, which is about 90 mins away by road. By the same token, Pescara, on the Adriatic coast is just over an hour away, with Naples about two hours distant. Enjoy this short video taken above Rocca di Mezzo showing the wide high plain and the nearby mountains of the Abruzzo Apennines.